This is a story about Glenn Toussaint who will try and make a name for himself in the world of football management. The almost 30-year-old saw the light of day for the first time in Charleroi on the 1st September 1987. He is the son of a Belgian mother and a French father. In the early years of his childhood it was clear that he was obsessed with football, and that he also has a talent for it. This talent brought him to his favourite club KRC Genk. At the age of 16 it was clear that the long drives and being away from his family (who lived over 2 hours away) had become too much for him. Toussaint decided to go play football closer to home and so he moved to LOSC Lille. At Lille he started to make a name for himself, but aged 23 a horror injury put an end to his dream of being a professional football player! After he recovered from his injury he wanted a little break from football, it was too painful to watch or talk about football. At the age of 26, he couldn’t resist his passion for football anymore and decided to take up his coaching courses. 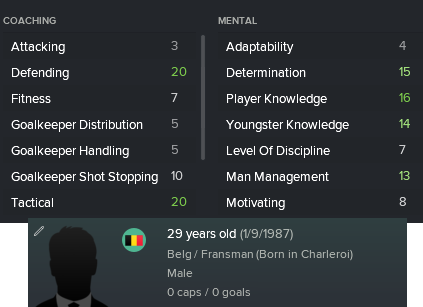 He started off with some assistant manager jobs at small teams in the area of Charleroi. At the age of 28 he started coaching the under-19 squad of his hometown team Charleroi. Just a year later after receiving good comments and media attention for his good work, he is ready for his first big job in management! This is a fictional manager, with some elements of my real life! In the next episode I will tell the story as Glenn Toussaint! This is the beginning of a new Football Manager 2018 series here on VivaLaVidaFM. The story is written by FMRookieGlenn and is his first piece of Football Manager written content, so do leave some comments below if you have any advice! And be sure to follow Glenn through his Twitter linked here. This entry was posted in FM18 Stories, Football Manager 2018, KRC Genk | @FMRookieGlenn and tagged charleroi, fm stories, fm18, fmrookieglenn, football manager, KRC Genk. Bookmark the permalink.